At 7pm on the dot, Acadamy's visitors were picked up with a melodic intro to join the ride through the Gloryhammer universe. The band shows up one by one, and the show gets started as soon as all characters are welcomed on stage - “Rise Of The Chaos Wizards”. 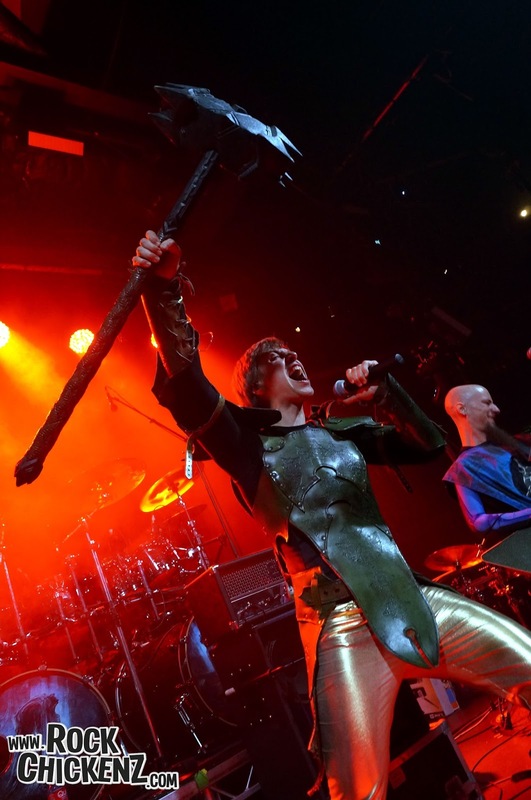 The Gloryhammer characters play along in their galactic costumes spreading loads of energy and passion. The pronounced mix of both musical composition and theatricality is there from the very first moment. The crowd is taken with the fantastic spirit and sound of Gloryhammer. Next, the brave hero Angus McFife presents and tells “The Legend Of The Astral Hammer”. Angus McFife receives great support from the crowd, all mighty warriors are encouraged to jump, to shout – simply to rock. James becomes very thirsty later on and the fans help him to finish his canned beer in an appropriate manner just before the band goes on with “The Hollywood Hootsman”. Gloryhammer entertains during and between the songs persistently. Finally, Angus McFife and the evil Zargothrax face each other in a thrilling combat. “The Unicorn Invasion Of Dundee” turns the whole Acadamy upside down. Gloryhammer provides a majestic performance: unique power metal, synchronised lights with the story, permanent entertainment and last but not least a strong voice. To close this review in short: Gloryhammer – indeed a glorious experience. To close this concert review even shorter and Gloryhammer-adequately: HOOTS!